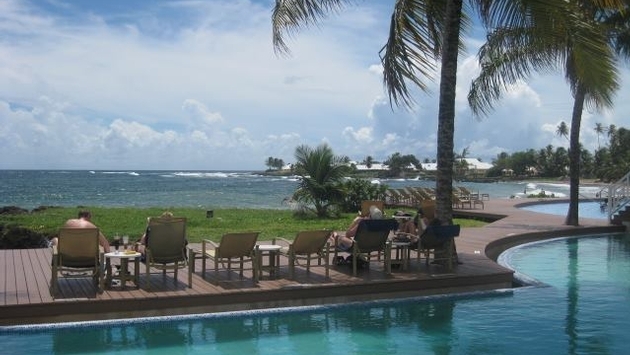 PHOTO: Tobago's Magdalena Grand Beach & Golf Resort is just one of many venues offering the perfect respite from the cold. As much of the U.S. remains mired in a “vortex” of interminably frigid winter weather, Caribbean hotels, resorts and vacation operators continue to launch new deals that offer ice-encrusted U.S. residents opportunities to thaw out on one of the region’s sunny beaches. Many of the packages are tied to Valentine’s Day and offer outstanding values for romantic couples looking to warm things up. For example, Tobago’s Magdalena Grand Beach & Golf Resort is offering a two-night "Tobago Love" package featuring an oceanfront suite with a complimentary upgrade to a one-bedroom suite (based on availability) for $699, double occupancy, from Feb. 14 to 16, 2014. The package also includes champagne and chocolate-covered strawberries upon arrival and return airport transfers in a limo with champagne. Jamaica’s Doctors Cave Beach Hotel in Montego Bay is offering a “Romantic Weekend Getaway” package featuring rates starting at $103 per night, double occupancy for stays between Feb. 13 and 18, 2014. Travelers must book by January 31. The boutique Jamaican eco-resort Hotel Mockingbird Hill is offering a “Romantic Interlude Retreat” package featuring four nights’ accommodations with daily breakfast and dinner, a Rio Grande rafting excursion and daily happy hour cocktails. Bermuda is technically outside of the Caribbean, nevertheless several hotels and resorts around the sunny archipelago are offering packages that allow travelers to head for its pink-sand beaches. The island-wide “Pink Sale” promotion offers 50 percent off room rates at participating resorts for bookings made through February 3. The offer applies to travel from Feb. 4 to April 30, 2014. Participating hotels include the Cambridge Beaches Resort & Spa, Elbow Beach Bermuda, Fairmont Hamilton Princess, Fairmont Southampton, Grotto Bay Beach, Newstead Belmont Hills Golf Resort & Spa, Rosewood Tuckers Point Resort, Rosedon Hotel Bermuda and The Royal Palms. Details are available at the Department of Tourism website.